Piso Fare 2019 Promos Until 2020: What to do with P999 Promo Fare? Let us give you an idea. Are you still thinking of what to give to your family, friends or colleagues at work as a Christmas present? Well, this one doesn't need any wrapping. You can go online and book them a flight to their favorite destination as a surprise holiday gift from you. Isn't that a great idea? We are sure that this surprise and special gift will be something worth remembering. There are a lot of domestic flights that are currently on promo. You may want to check below on the available destinations with their corresponding fares. Those targeting an international trip, the cheapest you can get is P1,799 all-in one way fare and it could bring you to Hong Kong and Taipei. Those from Manila, Cebu and Clark could avail it. 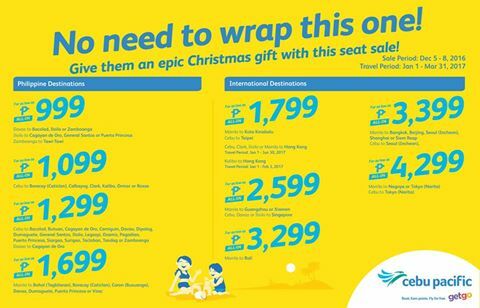 If you opt for Singapore, Xiamen or Ghuangzhou, the next promo fare you can get is P2,599. Other local cities from the Visayas region and Mindanao can have the chance for a direct flight going to Sydney, Australia. How's that? Isn't it that cool? I am planning to travel to Butuan on September 7, 2017 and back September 15, 2017. I am willing to buy ticket in advance, please inform me soonest.